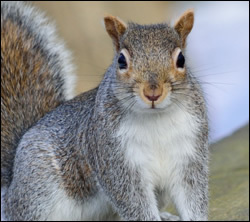 Squirrel Control The Woodlands experts offer a complete and full-service pest control company that will assist you with problems caused by squirrels, bats, raccoons, snakes, birds, skunks, Opossums and more. We love a challenge so give us a call. Our experience includes jobs such as wildlife management, raccoon control, skunk removal, snake removal, wildlife control, trapping, squirrel removal. Our expert technicians remove Squirrels in the attic and their nests and try to prevent stress or injury to them. This is also a practical and economical approach. Removing breeding Squirrels may leave the babies to die in your building, attracting unwanted bugs and parasites, causing further health risks. The Woodlands squirrel removal of carcasses is a time consuming, costly and sometimes necessary process.